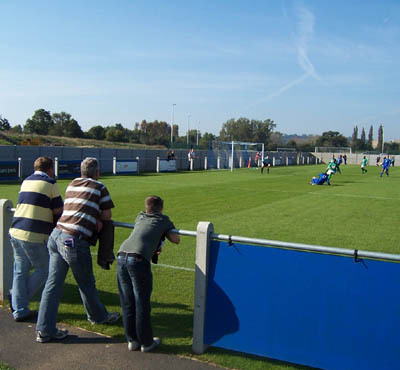 To cite the old Field of Dreams thing about “if you build it, they will come” might be overstretching it when Stratford Town have merely added roughly 30 or 40 to their gate since moving out of their old Masons Road ground. However when you consider that they were previously nearer to the train station and the town centre (albeit within an industrial far from in keeping with the town’s tourist-pulling quaintness), it certainly bodes well for the future. Still, despite being outside the main strip, Stratford are certainly getting some of the bigger crowds in the Midland Alliance, today’s attendance as good as double the next highest of the days fixtures - the 94 at Barwell vs. Causeway. Perhaps it is the combination of the sparkly and new with the familiar, one first timer at the tea bar noting that the new ground is just like “a modern version of the old Town ground.” He’s right really, all the facilities being on one side, beside and beneath the stand. One old chap reveals he’s come to every home game at Knights Lane thus far not despite his wife’s illness, but because of it; the doctor prescribing a couple of hours of Saturday absence as being potentially beneficial to his other half’s convalescence. Or at least that’s the way the tenner in the GP’s top pocket tells it. So Stratford have an audience and will be keen to improve on it. However, they’ve been stuck in the Midland Alliance since becoming founder members in 1994, and they’ve not exactly got off to a flier this season, hovering around mid-table albeit with several games in hand due to progress in the FA Cup up to the 1st Qualifying Round. 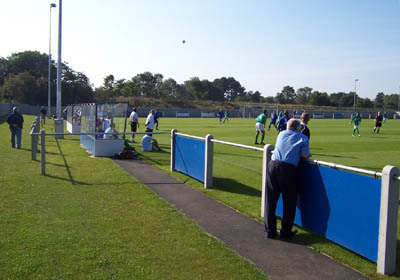 Coleshill were also occupying a mid-table berth but probably more grateful for it as they were initially refused promotion from the Midland Combination, even as champions, at the end of last season due to ground-grading issues. In the end the threat of a lawsuit, and possibly the suggestion that they might ‘send round some geezers’, was enough for the Midland Alliance to throw the floral garlands around their neck and let them into their party. 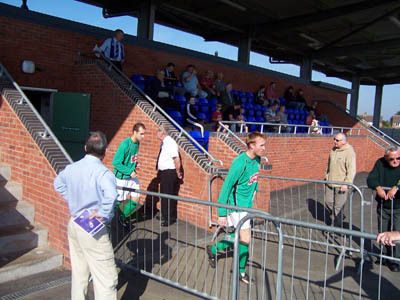 Judging by the start they made to this game, they are certainly not overawed by the step-up or the larger attendances. After only six minutes, James Dance flicked on an eyebrows header for himself, shimmied to the by-line and cut the ball back for Lee Bloxham to sidefoot powerfully into the top corner, much to the steaming annoyance of Micky Love, Stratford captain and a man who’s name would almost certainly be found in an out-of-context-League-of-Gentleman-quotes word search. The home side were quick to respond however, Jozsef Jakab getting inside the box, holding the ball up, turning inside his marker and studding the ball beneath the keeper into the corner of the net. This was met by the kind of quiet but sustained applause you would usually associate with a dogged 50 scored by a second XI no-mark on a county match Thursday. 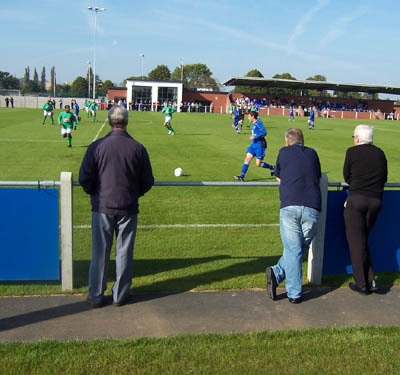 It soon became clear as to why as the tannoy announced it to be the one thousandth goal scored by Stratford Town in the Midland Alliance, becoming the first team to achieve this milestone, a stat which betrays their Rochdale-esque longevity within this single division league. Five minutes prior to half time, after plenty of good Stratford stuff ultimately signifying nothing, and a whole host of decisions going their way, Coleshill got their best chance since the goal, Matty Robinson broke behind Richard Robinson who misjudged the bouncing ball, but Robinson M’s strong lob over oncoming keeper Simon Lynn had just a little too much by way of legs, dropping onto the roof of the net. However given a similar opportunity two minutes later, Robinson made no mistake, turning and firing a shot that bowed like the earth over Lynn into the far top corner. Neither side started the second half in too bright a fashion, a midfield battle being the only sound heard, at least until the hour mark when the sound of running water became apparent, a Coleshill substitute taking the opportunity to duck under the pitch-side railing and rinse the boundary wall with a weighty Niagara of piss. Similar relief came to all of his team-mates three minutes later when James Dance sashayed past opera-house haunting, beret-sporting left back Michael Crawford and calmly slotted the ball beneath Lynn to establish a two goal lead. This appeared to signal the end of Stratford’s challenge. However in the 82nd minute, a cross came into the box and a Stratford shot was pushed athletically onto the bar. In the melee a dishonest hand was deemed to have popped out, and a penalty was awarded. David Foy’s kick was saved by former Stratford keeper Craig Johnson, with Jakab firing the rebound wide. However as the Coleshill team celebrated, the linesman drew his flag once more across his chest, as though it were his thumb across his throat, having spotted Johnson coming off his line. The keeper came even further off his line for Foy’s re-take but this time got nowhere near it. So that’s alright then. The wind was now in Stratford’s sails but they were unable to use it to make any further headway and 3-2 it remained, both sides leaving the pitch knowing they would meet again in the same venue the following week for an FA Vase tie. Despite the indications one could take from this game, Stratford won that tie 6-0, Coleshill now able to concentrate on keeping afloat in the Midland Alliance. Just stumbled across this site - was pretty impressed by the Havant & Waterlooville/Nellie the Elephant debate. Thanks for taking the time out to write this site - I actually spent my formative years in sunny Havant (although have now exchanged the South Coast for South London), and whilst I'm vaguely ashamed to say I see Portsmouth far more often than Havant and Waterlooville, it's great to stumble across all this... so, er, thanks! Thank you Jon, and rest easy, you can be cleansed! H&W have a London Branch after all - and we're away at Bromley on January 3rd. I might actually do that - I almost went down for the AFC Wimbledon game, but work put paid to that. I probably won't be doing much but recovering from New Years on the 3rd, and I guess Bromley is (almost) as good a place to do that as any. Well, hopefully our form will have improved by then. I think you may have found AFC Wimbledon quite depressing to watch! See you at the pigsty tomorrow?